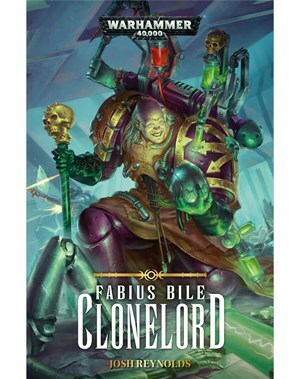 Drawn back into the deadly machinations of his former Legion, Fabius Bile finds his destiny lies in a forgotten world on the Eastern Fringe… a world called Solemnace. It's another outing for everyone's favourite mad scientist Space Marine, as he gets mixed back up with the Emperor's Children, and something altogether deadlier. Read it earlier today, a very much worthy sequel to the first book. Kept me hooked from end to end. Even more links to the Talon of Horus. Seems a bit uncertain to when the book is set in the timeline in relation to m40, seemed like centuries after the first book initially. But also noticed a comment of working for ten thousand years, which mightve been a slip? Who knows. I rate the book as a solid 9/10, engaging characters and a twisted storyline with twists and suprises. The big macguffin for the story is the lost geneseed tithe from the creation of the 3rd legion, which have ended up on Sollemnace. On the trip they encounter a black hole like celestial object, and an offhand comment is made about how one of the forgotten legions had sent an expedition there. Yes, they meet Trazyn and he is quite a delightful creature, the dialogue between him and Fabius is epic indeed. However Fabius also ends up on Harmony and facing the ruins of his great work in Canticle city, where Abbadon's sword had struck. But..
One of his incubation tanks had survived, kept powered by minions worshipping Fabius. It turns out to contain. A clone of Fulgrim, and Fabius is startled to discover that the clone is pure and uncorrupt. And against his better judgment, he frees the unmatured primarch before the incubation pod could break down. As a sideplot we see Fabius rearing Fulgrim, and comming to deal with a rebellious primarch that soon doesnt listen to him, and..
Starts to remember himself, weeping at the thought of what he had done to Ferrus and wanting to reforge his legion with the aid of the geneseed tithe and paying for his crimes. Fabius had discovered that the Primarchs stored their memmories in their blood and bone, and why it was possible to recreate them. Even Horus. He had spent a lot of time aquiring genesamples from all of the Emperor's sons. It is a dream to not come to be, such failed potential of what which could have been. Thanks to a bargain with Trazyn, Fabius avoids becomming part of his collection and even recovering the geneseed tithe. He asks Trazyn to take the primarch instead, the necron commenting he had come close to capture one many centuries ago, and absconds with Fulgrim 2.0. Fabius feared slipping back into the role of the legion of old, all his work comming undone with his new men kneeling before the reborn Fulgrim. I so wanna read the spoiler but at the same time I wanna read the book first. I really liked the 1st one. I would strongly endorse reading the book first. The spoiler is something you'll never believe. I have yes. Very impressed by all of it, especially the plotline you talk about in the spoiler tags. Really didn't see any of that coming, and how it ended blew my mind. One favourite moment was definitely on Solemnace when the dust forms a skull in the air before fading away and the Son of Horus says "You all saw that right?" Definitely a sequel that matches the original and may even surpass it, and more proof that Reynolds is as good with 40k as he is with Age of Sigmar. Also loved all of Fabius's conversations with the Dreadnought, an unwilling traitor given up on life made for a very interesting character. I definitely want to see what mischief Fabius commits in his next outing with the lead he gets. I think few chaotic characters has been so gleefully endearing as dear Fabius.